Samlerhuset joins the hunt for the origin of the Kingdom of Norway - Samlerhuset Group B.V.
Searching for archeologic evidence of the Viking battle that eventually made Harald Fairhair the first king of Norway around 872 AD. From left Ole Bjørn Fausa, Samlerhuset, and Sigbjørn Daasvatn, the Association Findings in Hafrsfjord. Samlerhuset becomes the main sponsor of The Association Funn i Hafrsfjord (Findings in Hafrsfjord – FiH) and join them in the hunt for the origin of the Kingdom of Norway. FiH will scan the seabed in Hafrsfjord outside Stavanger in Western Norway, searching for archeological evidence from the famous battle between Harald Fairhair and his enemies around 872 AD. The project will make use of the latest in advanced technology from the oil and underwater industry. The purpose of the Association Funn i Hafrsfjord is first and foremost to assist in assuring that Norway’s national historical heritage is enriched by historical evidences from the Battle of Hafrsfjord, the battle that eventually led to the Viking-king Harald Fairhair becoming the first king of Norway around 872 AD. In addition to financial support, Samlerhuset will also contribute in making findings, images and videos from the highly advanced project available to the public. Our hope is to document the decisive battle once and for all. – We simply love history, and personally, I must admit I have a soft spot for the Viking age. Imagine if we could finally document this very important part of Norwegian and European history, says founder of the Samlerhuset Group Ole Bjørn Fausa. This is not the first time Samlerhuset has contributed to historical projects. In 2016 Fausa joined a group of experts to look for the remains of the Norman king Rollo (father of Wilhelm the Conqueror) to identify his origin – and thereby the royal house of the United Kingdom. Due to the rare seabed conditions of Hafrsfjord, the FiH is optimistic that advanced modern technology will help find proof of the battle more than 1100 years after it took place, according to the Viking sagas. 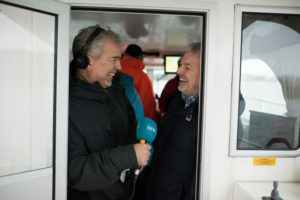 Sigbjørn Daasvatn and Ole Bjørn Fausa onboard the “Freya”, the ship that traces the seabed beneath the fiord. If we succeed in finding objects considered to originate from the Battle of Hafrsfjord, it will shed light on the actual event and bring it closer in our shared national consciousness in Norway. By revealing concrete evidence, the battle site will emerge from the ancient sagas, and gain a more clarified, central and rightfully place in the history of Norway today. This will be a comprehensive job with regard to studying the methodology, equipment and vessels needed to perform suitable marine operations in Hafrsfjorden. Seabed survey signals will require extensive analyses, and careful marine archeological procedures need to be stablished for the operation. Popular with the press: Ole Bjørn Fause being interviewed by the Norwegian Broadcasting Cooperation. FiH is led by Sigbjørn Daasvatn. He is the director of Technology Development at Subsea 7, a world-leading seabed-to-surface engineering, construction and services contractor to the offshore energy industry. In addition, FiH also includes other experienced colleagues from the oil industry, as well as specialists in history and various other relevant professions. You can find relevant updates on progress and information from the project at their website www.hafrsfjord.org. – We can find everything from swords, axes, spears, iron knives, bows and arrows, to viking ships. If a ship has taken in enough water, it may well have sunk. With the good conservation conditions in the fiord, there is a good chance that a potential Viking shipwreck may still be in a good condition. Finding the remains of a Viking ship…now that would have been amazing, says Daasvatn. 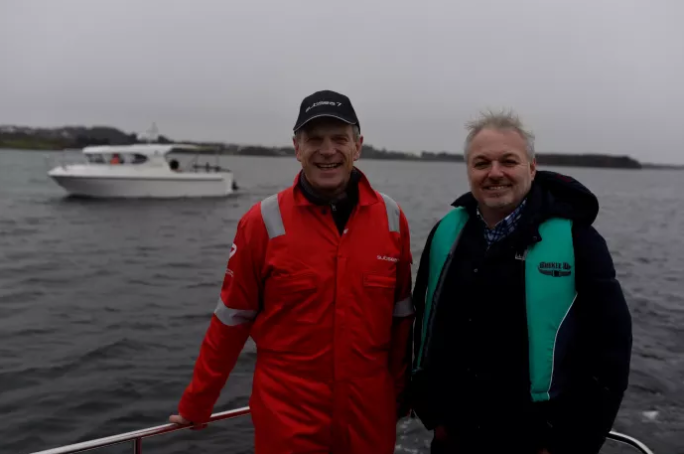 Samlerhuset is one of three main sponsors of the historical project led by the Association Findings in Hafrsfjord, the others being Subsea 7 and Northern Research Shipping.